Look, we’re not going to sugarcoat this: you may have been compromised. Check your phone. If you don’t notice anything amiss, it may be worse than you think. Fair warning: a new app called Secret SMS Replicator is out there, and it can monitor every text message you ever send without your knowledge. Be very afraid. Now, you should know that right now this is only for Android phones, so if you’re packing a smartphone of a different nature, you’re safe (for now). But if you’re holding Android, you need to know the facts, and only the facts. Maybe you’ll be in the shower. Maybe it’ll be at a masquerade ball during a riveting tango that has you distracted. But the reality is that during a vulnerable moment, someone can take your phone, download this app, have it run silently in the background and then monitor every text message you send from their phone without you being the wiser. Of course, you could always go on the offensive (it’s the most effective form of defense, after all) and use the app yourself to get the drop on any would-be infiltrators (you just can’t shake those seductive Eastern European double agents). 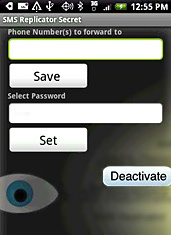 And if things should start to get a little too hot (as they often do in the spy game), you’ll be able to deactivate the program remotely through a secret text password. Speaking of which, this message will now self-destruct.